Azure Files supports identity-based authentication over SMB (Server Message Block) (preview) through Azure Active Directory (Azure AD) Domain Services. Your domain-joined Windows virtual machines (VMs) can access Azure file shares using Azure AD credentials. Azure AD authenticates an identity such as a user, group, or service principal with role-based access control (RBAC). You can define custom RBAC roles that encompass common sets of permissions used to access Azure Files. When you assign your custom RBAC role to an Azure AD identity, that identity is granted access to an Azure file share according to those permissions. As part of the preview, Azure Files also supports preserving, inheriting, and enforcing NTFS DACLs on all files and directories in a file share. If you copy data from a file share to Azure Files, or vice versa, you can specify that NTFS DACLs are maintained. In this way you can implement backup scenarios using Azure Files, preserving your NTFS DACLS between your on-premises file share and your cloud file share. Azure AD authentication over SMB is not supported for Linux VMs for the preview release. Only Windows Server VMs are supported. Azure AD authentication over SMB is not supported for on-premises machines accessing Azure Files. Azure AD authentication is available only for storage accounts created after September 24, 2018. Azure AD authentication over SMB and NTFS ACL persistent is not supported on Azure file shares managed by Azure File Sync Service. For an overview of Azure AD authentication over SMB for Azure Files, see Overview of Azure Active Directory authentication over SMB for Azure Files (Preview). Before you enable Azure AD over SMB for Azure Files, verify that your Azure AD and Azure Storage environments are properly configured. It's recommended that you walk through the prerequisites to make sure that you've performed all of the required steps. 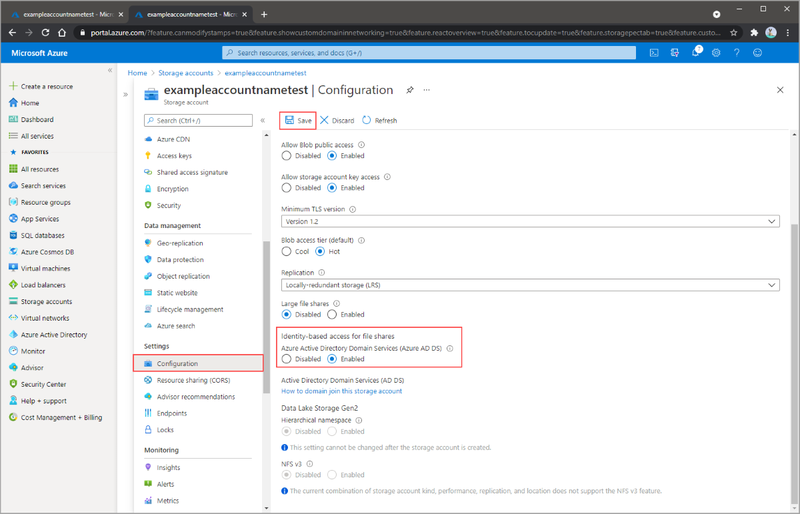 Enable Azure AD authentication over SMB for your storage account to register the storage account with the associated Azure AD Domain Services deployment. Assign access permissions for a share to an Azure AD identity (a user, group, or service principal). Configure NTFS permissions over SMB for directories and files. Mount an Azure file share from a domain-joined VM. The diagram below illustrates the end-to-end workflow for enabling Azure AD authentication over SMB for Azure Files. Select or create an Azure AD tenant. You can use a new or existing tenant for Azure AD authentication over SMB. The tenant and the file share that you want to access must be associated with the same subscription. To create a new Azure AD tenant, you can Add an Azure AD tenant and an Azure AD subscription. If you have an existing Azure AD tenant but want to create a new tenant for use with Azure Files, see Create an Azure Active Directory tenant. Enable Azure AD Domain Services on the Azure AD tenant. To support authentication with Azure AD credentials, you must enable Azure AD Domain Services for your Azure AD tenant. If you aren't the administrator of the Azure AD tenant, contact the administrator and follow the step-by-step guidance to Enable Azure Active Directory Domain Services using the Azure portal. It typically takes about 15 minutes for an Azure AD Domain Services deployment to complete. Verify that the health status of your Azure AD Domain Services shows Running, with password hash synchronization enabled, before proceeding to the next step. Domain-join an Azure VM with Azure AD Domain Services. To access a file share using Azure AD credentials from a VM, your VM must be domain-joined to Azure AD Domain Services. For more information about how to domain-join a VM, see Join a Windows Server virtual machine to a managed domain. Azure AD authentication over SMB with Azure Files is supported only on Azure VMs running on OS versions above Windows 7 or Windows Server 2008 R2. Select or create an Azure file share. Select a new or existing file share that's associated with the same subscription as your Azure AD tenant. For information about creating a new file share, see Create a file share in Azure Files. For optimal performance, Microsoft recommends that your file share is in the same region as the VM from which you plan to access the share. Verify Azure Files connectivity by mounting Azure file shares using your storage account key. To verify that your VM and file share are properly configured, try mounting the file share using your storage account key. For more information, see Mount an Azure file share and access the share in Windows. To enable Azure AD authentication over SMB for Azure Files, you can set a property on storage accounts created after September 24, 2018, using the Azure portal, Azure PowerShell, or Azure CLI. Setting this property registers the storage account with the associated Azure AD Domain Services deployment. Azure AD authentication over SMB is then enabled for all new and existing file shares in the storage account. Keep in mind that you can enable Azure AD authentication over SMB only after you have successfully deployed Azure AD Domain Services to your Azure AD tenant. For more information, refer to the prerequisites. In the Azure portal, navigate to your existing storage account, or create a storage account. In the Settings section, select Configuration. Enable Azure Active Directory Authentication for Azure Files (preview). The following image shows how to enable Azure AD authentication over SMB for your storage account. Next, create a new storage account, then call Set-AzStorageAccount and set the EnableAzureFilesAadIntegrationForSMB parameter to true. In the example below, remember to replace the placeholder values with your own values. Next, create a new storage account, then call az storage account update and set the --file-aad property to true. In the example below, remember to replace the placeholder values with your own values. To access Azure Files resources using Azure AD credentials, an identity (a user, group, or service principal) must have the necessary permissions at the share level. The guidance in this section demonstrates how to assign read, write, or delete permissions for a file share to an identity. Full administrative control of a file share, including the ability to assign a role to an identity, requires using the storage account key. Administrative control is not supported with Azure AD credentials. To grant share-level permissions, define a custom RBAC role and assign it to an identity, scoping it to a specific file share. This process is similar to specifying Windows Share permissions, where you specify the type of access that a given user has to a file share. The templates shown in the following sections provide either Read or Change permissions for a file share. To define a custom role, create a JSON file and copy the appropriate template to that file. For more information about defining custom RBAC roles, see Custom roles in Azure. The following custom role template provides share-level Change permissions, granting an identity read, write, and delete access to the share. The following custom role template provides share-level Read permissions, granting an identity read access to the share. To create the custom role, use PowerShell or Azure CLI. The following PowerShell command creates a custom role based on one of the sample templates. The following Azure CLI command creates a custom role based on one of the sample templates. az role definition create --role-definition "<Custom-role-def-JSON-path>"
Next, use PowerShell or Azure CLI to assign the custom role to an Azure AD identity. 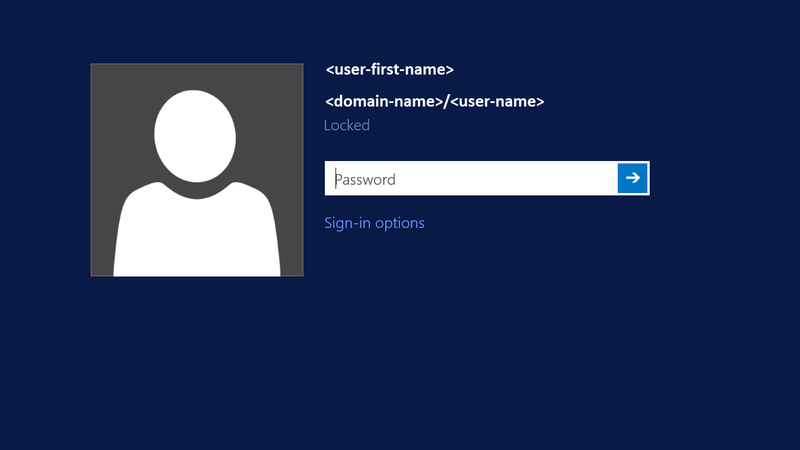 The following PowerShell command shows how to list the available custom roles and then assign a custom role to an Azure AD identity, based on sign-in name. For more information about assigning RBAC roles with PowerShell, see Manage access using RBAC and Azure PowerShell. When running the following sample script, remember to replace placeholder values, including brackets, with your own values. #Assign the custom role to the target identity with the specified scope. The following CLI 2.0 command shows how to list the available custom roles and then assign a custom role to an Azure AD identity, based on sign-in name. For more information about assigning RBAC roles with Azure CLI, see Manage access using RBAC and Azure CLI. az role assignment create --role "<custom-role-name>" --assignee <user-principal-name> --scope "/subscriptions/<subscription-id>/resourceGroups/<resource-group>/providers/Microsoft.Storage/storageAccounts/<storage-account>/fileServices/default/fileshare/<share-name>"
After you assign share-level permissions with RBAC, you must assign proper NTFS permissions at the root, directory, or file level. Think of share-level permissions as the high-level gatekeeper that determines whether a user can access the share, while NTFS permissions act at a more granular level to determine what operations the user can perform at the directory or file level. Azure Files supports the full set of NTFS basic and advanced permissions. You can view and configure NTFS permissions on directories and files in an Azure file share by mounting the share and then running the Windows icacls or Set-ACL command. The preview release supports viewing permissions with Windows File Explorer only. Editing permissions is not yet supported. To configure NTFS permissions with superuser privileges, you must mount the share with your storage account key from your domain-joined VM. Follow the instructions in the next section to mount an Azure file share from the command prompt and configure NTFS permissions accordingly. Use the Windows net use command to mount the Azure file share. Remember to replace the placeholder values in the example with your own values. For more information about mounting file shares, see Mount an Azure file share and access the share in Windows. Use the following Windows command to grant full permissions to all directories and files under the file share, including the root directory. Remember to replace the placeholder values shown in brackets in the example with your own values. For more information on how to use icacls to set NTFS permissions and on the different type of permissions supported, see the command-line reference for icacls. Now you are ready to verify that you've completed the steps above successfully by using your Azure AD credentials to access an Azure file share from a domain-joined VM. First, sign in to the VM using the Azure AD identity to which you have granted permissions, as shown in the following image. Next, use the following command to mount the Azure file share. Remember to replace the placeholder values with your own values. Because you have already been authenticated, you do not need to provide the storage account key or the Azure AD user name and password. Azure AD over SMB supports a single sign-on experience using Azure AD credentials. You have now successfully enabled Azure AD authentication over SMB and assigned a custom role that provides access to a file share to an Azure AD identity. To grant access to your file share to additional users, follow the instructions provided in step 2 and 3.